abandoned shucks and a lone Chironomid pupa. In this article, The Truth About Chironomids Part One, Carol discusses some truths about fishing deep with Chironomids. In The Truth About Chironomids Part Two, she reports on the quick-strip technique used to fish deep with a Chironomid imitation. 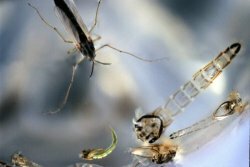 Because Chironomids are ranked as one of the most important sources of food for trout in lakes, it is important to understand their biology and behavior. In The Truth About Chironomids Part Three, the details about the life cycle and unique characteristics of Chironomids are revealed, and three hot chironomid pupa patterns recommended by the experts are introduced. Nothing will hone your skills faster than getting thrown into a difficult situation and having to deal with it. It's true in life, and certainly true in fly fishing. I found myself in just such a situation when I first fished on British Columbia's famous Kamloops trout lakes—that's where I discovered the truth about Chironomids. One day comes to mind when we were fishing on one of those beautiful lakes—I was with my husband Skip and a group of anglers that included our friend and guide, Gordon Honey. From my previous attempts at fishing Chironomids, it was dawning on me that if I wasn't catching anything, it was probably because I wasn't fishing the fly deep enough. Even though no one was having any luck that day, I felt the "not-deep-enough" theory could still be in play, so I slid my indicator up the leader until my fly was hovering just above the lake bottom. I was about to start my retrieve when the line jerked, and a trout around six pounds rocketed into the air about twenty feet to the right of where my line entered the water. I couldn't strip line in quickly enough. As soon as the fight started, it was over; he threw the hook. OK, I thought as I sat down, heart pounding. That day up in Kamloops several years ago was a turning point for me. It is just one of the reasons that in my mind, as in many fly-fishers' minds, the Kamloops lakes of British Columbia conjure up images of leaping trout and fishing with Chironomids. The city of Kamloops has more than 200 trout lakes within an hour's drive, and they are home to myriad species of Chironomids. Some are huge; they are nicknamed "bombers" by the locals—these pupae can be up to 25 millmeters long. They have made these lakes fertile testing ground for fly fishermen for decades, especially with their prolific hatches and big, energetic trout. 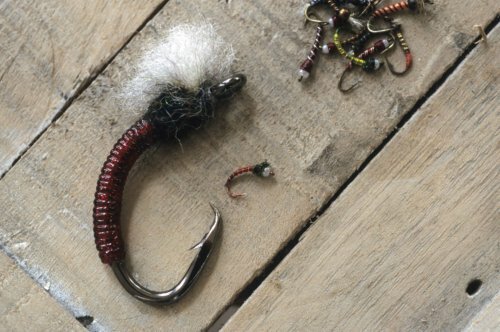 It is no surprise then that a new method, called the "quick-strip technique", has emerged in the last few years for fishing a deep Chironomid fly below a strike indicator. So, intrigued by the promise of big trout, this past June I traveled up to British Columbia, along with Skip, to test this new technique. Our friend and guide Peter Morrison joined us to demonstrate this new method, and also to help us test a number of new Chironomid patterns. colors found with this prolific lake insect. For an in-depth discussion about the quick-strip technique used to fish deep with a Chironomid imitation, go to The Truth About Chironomids Part Two. For a discussion about the life cycle and characteristics of Chironomids, and to see three hot chironomid pupa patterns recommended by the experts, go to The Truth About Chironomids Part Three.